You can make something as simple as angel food cake, berries and whipped cream a bit more "elegant" with a splash of your favorite booze! To keep it kid friendly, just omit the alcohol. Now, a last-minute dessert can become a totally elegant treat. Serve in martini or wine glasses, and boom! Dessert is hassle-free and done! In a large bowl, lightly toss berries, sugar and VeeV. Allow flavors to blend, then top angel food cake with berries and boozy whipped cream. 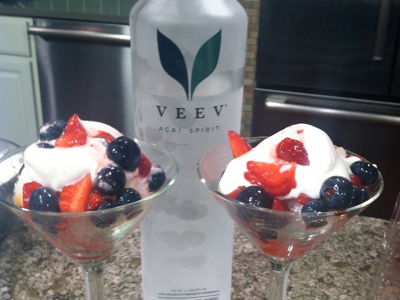 *If you cannot find VeeV, look for your favorite berry flavored vodka to compliment your berries. To make homemade whipped cream, with a whisk or hand mixer, beat heavy cream. (Always start with a cold bowl and beaters that you have placed in the freezer.) Add Veev, sugar and whisk or beat until desired consistency for whipped cream. Set aside.